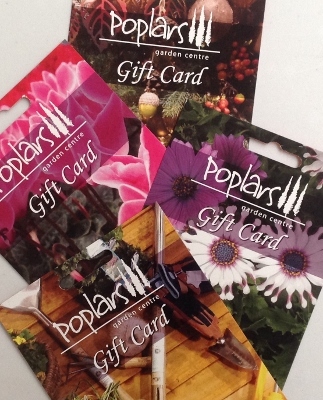 We have been selling our very own Poplars Gift Card in store since December and we were thrilled to see how many were bought as Christmas gifts. We are looking forward to seeing lots of the lucky recipients in store soon! These cards can be redeemed in the Garden Centre and the Restaurant@Poplars and more funds can be added to an existing card if you so wish. To purchase a card, just ask our friendly till staff and they will load anything from £10-£100 onto it for you. There is also a selection of backing cards to choose from.